​We are proud to provide Southern Ontario's best quality customer service and with 100% satisfaction. Welcome to King City Decks & Fence. We are a dedicated group who thrive on outdoor revitalization and enjoyment; we specialize in all forms of backyard improvement beginning with your valued deck, gazebo and pergola in the Whitchurch–Stouffville area of York Region. Our mission is to help our customers design and build the best quality decks for the best price that will reflect the beauty of the Stouffville area and to create backyards that will hold their great looks and functionality for years to come. If you are looking for different options regarding finishes, we have amazing railings and gates and gazebo designs, along with interesting alternative surface finishes that are sure to please you. Our deck building prices will always be ultra competitive and our gazebos and pergolas will come with fair and affordable pricing. The value we bring is as good as it gets for your money; nobody wants to overspend or compromise on quality. With area attractions near Stouffville such as Musselman's Lake, Preston Lake, Pleasantville, Ringwood and other hamlets there is no shortage of events and sights to take in. First founded around 1790, the area has grown to become an attractive place to settle and gets closer to becoming one with Toronto. New home building dominates the area but you can still find century homes sure to please those who are looking for a nostalgic dwelling to call home. In order to plan and construct a great deck or gazebo, you need to know King City Decks & Fence is fully up to date on products, designs and regulations which is how we are able to provide up t date and accurate information, but more importantly, beautiful decks. Decking materials, can be low-cost pressure treated wood and cedar materials, ranging all the way up to newer composite decking and IPA and to some exotic hardwoods. 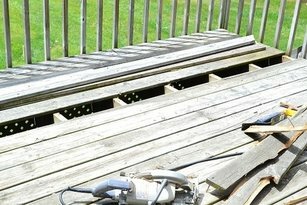 Decks take a fairly hard beating from the sun and weather elements so it's no surprise when you suddenly notice that the time has come to pay attention to the back yard structures; that they are getting tired and in need of repairs and a freshly finished look. We have long time experience in working with wood, synthetic and concrete products and the building of structures such as decks, gazebos, sheds, fences and, patios. Take some time with Joe and see how creative you can be with a design that will look amazing, but wo0n't break the bank. Decks and fences will give you all the use and love you need but it's directly related to the care and maintenance you put into them. Maintenance of your valued deck or other structures to keep them in ship-shape and lasting longer is required without question. Excellent man-made composite products are also available and can help decks last longer and look better with as much maintenance. If you are considering building or refurbishing your deck, please give us a call, we can provide just exactly what you need without breaking the bank. 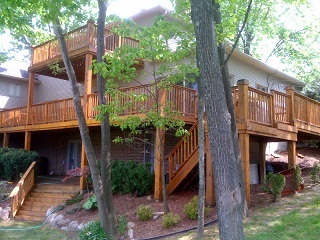 ​Deck design, deck building, and deck refurbishment are all included in our services that we offer. ​If you're thinking of building a deck or restructuring an existing one, be sure to call us for a consultation where we can go over by-laws, designs, and optimizing the project to the maximum possibilities whether pressure treated, red cedar or composite. We take great pride in our customer service and relations, and we never stop working hard to earn it. It is our intention that every project we start will be completed without interruption until completed. Severe storms, missing materials and other unusual circumstances can cause delays but we will do everything to finish on time. Eaves troughs, soffits and drains can drag a home down if they are not at their best. You would be very surprised how freshly cleaned eaves or new eaves and drain materials can revitalize a home. Check out our eaves and gutters page.